I've basically standardized on the ford f450 as my farm truck; the model year 2000 and 2001 has a good engine, the 7.3 liter diesel, and they're pretty much bomb proof. The f450 can carry a couple of tons of weight comfortably, and is rated to tow a 22,000lb trailer. We usually tow trailers that weigh about 8,000lbs, but occasionally move a tractor around, so the extra capacity is used. I've got three of them, the latest was a county truck, purchased at auction. They'd taken a flatbed and put a bunch of toolboxes and stuff on the back, which I actually like: it drives the price down for the basic truck. in 30 minutes with a grinder and a cutting torch we're back to the original flatbed. Where the toolboxes rested on the bed the wood is rotted out, but the frame members are ok. an hour of work with a crowbar and a saw, and we're down to the bed frame itself. The county added a steel plate across the back of the truck, which put another 250lbs of weight on the truck, and that's something that I really don't need for my application. By removing the plate I can both attach the new boards more easily, and I'll save fuel for the rest of the life of the truck -- I don't have to move that weight around. I measure up the bed, and with a little bit of math figure out that if I space the boards 5/16th" apart, I don't need to cut a board. The original deck was tongue-and-groove, which does make for a stronger deck surface, but I've found that 2x6" douglas fir boards stand up well, and are unlikely to break under my typical loads. What's nice about this particular bed is that they've put 4 big toolboxes under the bed -- two on each side, and you really can't have enough storage space on a working truck. Straps, binders, chains, you name it. And this is the new, finished flatbed truck. 8.5x12' flatbed. We'll be using it a lot I think. Picking up hay and feed, farm materials, transporting equipment and tractors. The US is finally looking like we'll be back in the horse slaughter business, and honestly, it cannot come too soon. Take a look at this video for an example of what's happening now. I make the trip to the auction about once a month; I sell some of my animals there, and I've been looking for a young bull for a while, and I just have to wince every time we get to the horse portion of the auction. There's a sad parade of horses, some young, some old, some with stories, some without, and they get sold for pennies a pound. It really makes me question why people keep horses at all when they're valued so little. Who is breeding all of these discard horses? It seems to be mostly women who are associated with these horses; that's who I see handling them mostly, and I wonder what the attraction is. It certainly isn't financial -- I see horses as one step up from boats. A boat is a hole in the water that you throw money into. What you don't see in the video is that the owner of the horse paid $25 to put the horse into the auction ring - and pays that whether the horse sells or not. I have to give credit to the horse owner -- they are doing about the only thing that they can to dispose of an unwanted horse, but there are many other owners who don't bother to take them to the auction; they'll just turn them loose on someone Else's property, or put them into someones trailer while they're out on a ride. Friend of mine was out endurance riding and came back to find their trailer full; there was no room for their own horse. While it did cost the horse owner something, this was cheaper than calling a vet to euthanize the horse and then a rendering plant to dispose of the corpse -- that runs $300-$500 in my area. If you have a neighbor with a rifle and a backhoe it's a bit cheaper, and some horses go that way, but it seems like such a waste to me. I'm all for having animals as pets, but I draw the line when the pet weighs more than a few hundred pounds and costs the general public millions of dollars a year. I'd like those folks who would ban horse slaughter to step up and take all of these horses I see every week, and more importantly; the horses that I don't see every week that get abandoned or neglected and then the county government has to step in to rescue at huge expense. Horses should be licensed, and the license fees should be sufficient to pay for the costs that are inflicted by horse owners on the general public. If you can't afford a license, you can't afford hay. I got a call from a neighbor down the road; he'd cut, raked and baled 2,000 small square bales, and wanted to know if I wanted some hay. Sure, I said, and put together a crew of 6 guys, two trucks and trailers, and a tractor and headed down to his place. ...only to find that he had 2,000 bales in the field, and no plan on how to get them to the barn. He's got a bale wagon, but no matter how you cut it, it's not going to get into the barn by itself. So I had my crews and trucks pick bales out of the field and stack them in his barn. We stacked 670 bales in 5 hours, but looking at the weather forecast it was for rain the next morning, and in fact it did rain; ruining the 1300 bales that got left out in the field. I was glad to help a neighbor out, but a little annoyed that he'd messed around; we had two weeks of very good weather, and he waited until the end of it, and then when he needed help he waited until it was very difficult to help him to ask for help -- and even when he did ask, it wasn't clear to me what the situation was until I got to his farm. I wish he had called me a day or two earlier; we could have gotten all 2,000 bales into the barn, or into my barn, and I'd be set for hay for the year -- he's usually the guy I buy from -- but this year it looks like I have to find a new supplier. This really kills me from the sheer waste of it. A day or two earlier and I could have had my hay and his hay, and I'd have cheerfully supplied the crew to make it happen. I've been using the small squares (approximately 60lb bales) because they're easy to handle and for bedding purposes -- which is what I do with hay for the most part, bed pigs in it - it's a nice portion size. Last year though, I switched to 800lb round bales, and found them much easier to deal with when feeding cows. It meant that I could feed a bale and not think about the cows for a week or so, vs having to toss in a bale of hay per cow per day. This year I think I'll be buying round bales for the bulk of my hay. I'll still lay in some small squares, but mostly rounds for me. I've been working on choosing my hay supplier more carefully, too. I've found that people who are feeding what I'm feeding -- in this case, cows -- are probably the best source for hay. They care about what they bale and how it's treated because they'll be feeding it to their own livestock, and it shows when I feed hay from difference sources to the cows -- they much prefer the hay from the dairy farm I buy from vs the hay farmer I buy from. The dairy fertilizes their fields with the manure from the dairy and takes care of the fields; the hay farmer just cuts and bales; I've never seen him put anything back, and I think it makes a difference. the cows certainly think so. Just got back... 2012 drought pictures. I just got back to Seattle from a business trip to Iowa. It gave me a chance to look at the crops across a few states. I was born in california, and most of my experience with farming has been on the west coast, and I hadn't really noticed it before now, but I've basically assumed that most farms were irrigated. In eastern washington and various parts or oregon and california, irrigated desert land is the primary farming land, and while drought does affect the amount of water available, it makes the crops that they produce much less susceptible. I'm not going to talk about senior water rights or junior rights or the whole topic of water rights in this post, my point is that on this trip I noticed quite a bit of land that was not irrigated, and it surprised me because I'd basically assumed that all farmland was. Eastern washington and pretty much anywhere that dryland farming was practiced is doing just fine. The small grain crops looked good. Here's some pictures. Drought or no, anyone who planted small grains this year seems to be doing pretty darned well. In eastern Washington and Wyoming and the western edge of Wyoming, the forage crops looked good too. Lots of bailing going on. But when I got to south Dakota, I noticed something odd. Something I have never seen. The farmers were haying the freeway shoulders. I saw baling activity from South Dakota, all the way through Minnesota and into Iowa. I finally stopped by the side of the road and talked to one of the farmers -- I was curious if this was a new policy, like the adopt-a-highway sort of thing. Save the state money by mowing the freeway grass? No, it's not that. Those thousands of farmers are haying the freeway shoulders because where they'd normally get a second or third cutting of hay, they've gotten NOTHING. The first cutting was stunted, and the drought basically made the grass go dormant, so there's thousands of farmers who are VERY worried about what they will feed their cows. The freeway shoulders provide a source of forage grass, and there are thousands of bales of hay being made there. I also saw farmers haying the fencelines and corners of their fields, and basically working very hard to get every bit of forage they could. I watch commodity prices because they do effect my farm operations. Feed prices, and meat prices, and they're part of what I look at when I'm making farming decisions. I watch the price of inputs (which is farmer-jargon for "stuff you have to buy") and I watch market prices of finished animals, and there are two things that are being very odd this year: Meat prices and feed prices. The first thing that struck me is that finished meats are at the highest prices I've ever seen. If you own a beef cow right you you are, in a market-price sense, a very happy camper. Beef prices are VERY high right now, and it's caused the prices of most cows to jump quite a bit. The prices I'm talking about here are wholesale prices -- the prices that farmers would get if they buy or sell. Retail prices are based on these. The summary of the next couple of paragraphs is that I expect beef and pork prices to go up a minimum of 20% over the next 12-18 months. Calves are selling for $1.50 to $2 a pound, live weight. a good looking 300lb calf that I used to be able to purchase for $150 is now going for $300 or $450, or $600! dollars. To give you some perspective, in January 2012, $1.26 a pound live weight was the most it had EVER been. At this point we are up another 30% from that record price. The 300lb calf that I see at the sale today is your steak in 12-14 months. You can expect beef prices to remain high for the foreseeable future. Finished cattle are selling for $.85/pound -- up from $0.60/lb two years ago. Take a look at a Washington state auction report. Pork is likewise high; the pig market in Washington state isn't as developed, but I've started to see auction prices that I consider pretty reasonable (as someone who sells pork). a 280lb finished pig is getting $200-225 at auction, which is lower than my cost of production, but is a vast improvement over $90 for that same size pig 2 years ago. I'm seeing more no-sales at the auction from pig producers, which I appreciate. This is based on higher feed costs, a substantial and sustained drought in beef production areas (Midwest and south) and trends that have reduced the supply of both pigs and cattle. The drought is making feeding cattle and hogs more expensive, and it forced cattle producers to reduce their herds over the last few years. Both of those mean that the US cattle herd is at the lowest number it has been since the 1950s! "Demand light for moderate to heavy offerings" means that people are trying to sell pigs and there isn't much interest in buying them. Here's why: You know that heat wave that's hitting the Midwest? It's baking the corn to death, and at this time of year, there's no time to replant. So we're starting with higher corn prices to being with, and the corn crop this year is going to be less than optimal, and this is scaring the pork producers. The bottom of the weaner pig market has dropped out. The pork producers are terrified of buying pigs to finish and then having to buy corn that is even higher priced later this year, due to crop problems. Our US pork industry is dependent on our corn (maize) production to produce most of the pork that the US eats and exports. Corn prices are spiking right now. The market cycle for pork is shorter than for beef -- we're talking 6 months instead of 12 to 18 months. $12 a pig is far below the cost of production. The sow barns know this, and you can expect that most of the US pig herd will see a size reduction this year as a result. Which will mean less supply in 6-8 months, and higher prices due to low supply after that. So about the time you see that expensive steak hit the supermarket you'll also see expensive hams -- 12-14 months from now. So what am I doing on my farm? I'm buying cattle right now. I've got land to graze, and I'm putting cows on it. I'm betting that between the drought and herd reduction there will be a good return on beef, and since it takes a year for the market to come up with another cow. I expect beef prices to get lower in the near term (2-6 months) as the US herd is further reduced due to high feed prices, and then I'm expecting the prices to rise in 2013. I'm buying now so that I can sell into those higher prices I'm expecting in 12-18 months. 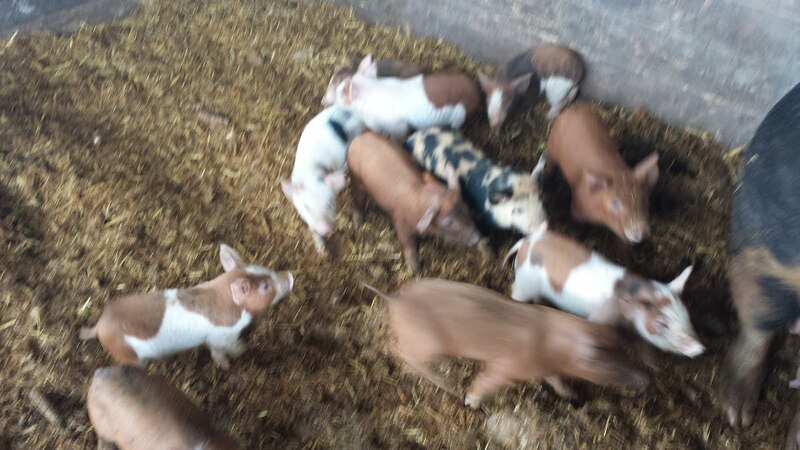 I'm retaining more piglets from my own operation. I'm feeding mostly fruits and vegetables, and so have no connection to the general feed cost issue that most farmers face, but I expect pigs to rise in price as farmers are forced to raise prices to cover their costs. Since corn prices will probably reach record levels this fall, pork prices will be pushed up, and I'll be selling into that market, too. What would I do if I were a consumer? I'd seriously consider buying a whole or half a beef RIGHT NOW or this fall. Buy before the prices rise. A whole or half will last you for up to 18 months, and your freezer allows you to reduce your beef prices. Buy a good cow now and save yourself some money. Buy a whole or half pig soon. You're already seeing pork prices at $3/lb for the lower value cuts in the supermarket -- a whole or half pig purchase will usually cost you around that, and you get the higher value cuts, too. The local producers are slower to figure out the feed cost issue, so you've got an opportunity to buy prior to price increase. This is a continuing project to raise a family milk cow. To see the first entry in the series, click here. To see the previous entry, click here, to see the next entry click here. It's been a little over a month, and the little heifer isn't so little anymore. The weight tape shows her at 630lbs, which means that she's gained 111lbs since the last entry. The last entry was on May 23rd, 46 days ago. So she's gained 111/46 or 2.4lbs a day, which is too fast a weight gain. What's been happening is that she's been getting into the pig feed, which she much prefers to the grass that we normally feed her, and it's been putting the weight on her. I'm going to have to put a stop to that. Her rumen doesn't look full -- it's that area below the backbone, on the left side, just ahead of the hip -- which means that she was probably eating feed today, instead of grass that would normally fill in that area. Bad cow. Actually, the cow isn't to blame. Bad me. It's a husbandry issue. Off to pasture she goes for a little slimming time. She's about 30 days ahead of where she should be by weight. The pasture she'll be in is this one. What we'll do is move the pigs out so that there's none of that tempting pig feed, just plenty of chest-deep grass. I've been very pleased with the way this grass has grown out. This pasture is the same one that I wrote about in this blog entry last september when i was working the ground just prior to seeding it. It's lush and green now; I've grazed it twice already. Puree the strawberries, add lemon juice, sugar and zest to taste, and freeze. The pigs would probably prefer sorbet, but they get their strawberries in the natural state. I use dogs for livestock protection and to do some vermin control - mostly rats, but also things like raccoons and possums and other things that like to eat chickens. My oldest dog, Monster, takes his job very seriously. He digs with his mouth and isn't afraid to get completely into a hole when he goes for something. His son Red is a little more relaxed. They'll usually tag-team; red will watch while monster digs, and usually will flush the critter, and then red will catch and dispatch. We haven't had much of a coyote problem for a couple of years now; most of that I attribute to the dogs. Not that the dogs have caught the coyotes, but the coyotes tend to steer clear of a pack of airedales. That isn't to say that it's been trouble free. When red was younger I had some issues.